This is applicable for 2015+ 6.8L applications only. This is by far the best product I have purchased for my 2014 V-10 Fleetwood BOUNDER. It is a shame that it is not standard, installed at the factory. Simply a great product that does what it advertises. 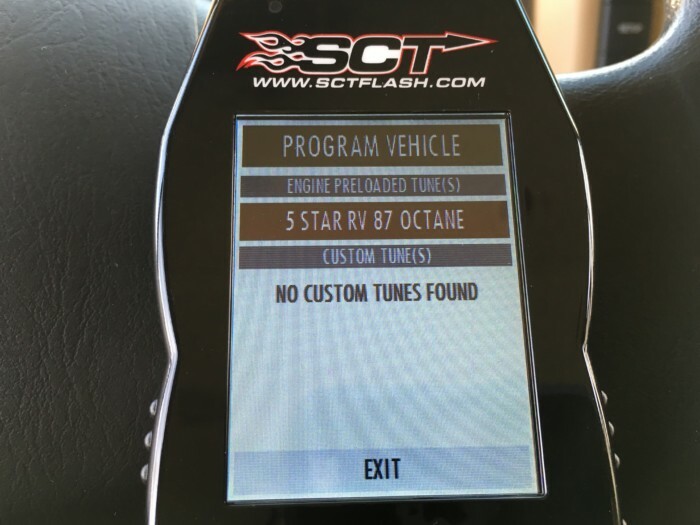 Just a quick note since I’ve installed my 5Star 87Tune. 1 word… Unreal!!! What a difference this is a great me and took less than 10 minutes to install. I installed the new tune at the KOA in Chattanooga TN. It took me about 10 – 15 minutes. The next morning I drove through the hills back to Ohio. Wow did I notice a difference. My 2016 Outlaw LS drove so much better than before. You can feel the difference while driving the on ramp of the freeway getting speed up to merge with traffic. So much smoother with the new shift patterns. Non of that screaming of the engine. In fact, it sounds quite sporty with a lower growl sound to the engine compared to the previous scream of the engine. Going through the hills was 100% better with this tune. I can’t say enough about it. Excellent product. A MUSH have for anyone with the Ford V10 6.8l drive train. I bought and installed before my 1st 2200 mile trip. Compared to the first trips in the 2015 Forest River Georgetown where if it smelled a hill it would downshift and overall mileage was between 6 and 6.3 mpg. 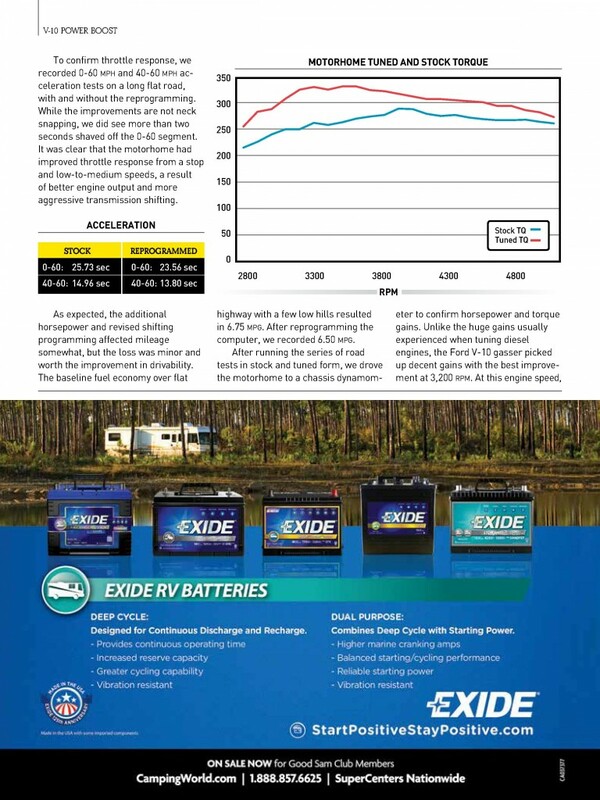 This 2200 trip brought the mileage up to 7.3mpg while towing a Nissan Frontier. I love it and recommend it to anyone with this drivetrain…. Hi, just wanted to thank you for rushing the RV tune to me on short notice so I could tune my V10 prior to my trip. WOW! what a difference it made in the hill pulling power on the rig. 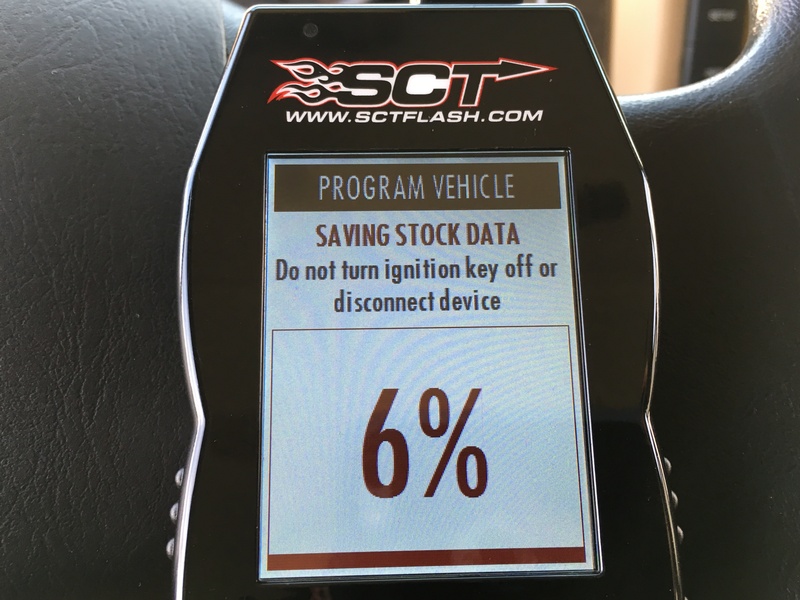 I especially like to change in shift points to keep the RPM around the peek torque range without the ‘Roaring’ double downshift of the stock tune. I was hesitant to get this because of the steep price, but am glad I did as the ‘driveability’ of the rig has improved greatly. I added the 5 Star Tune to our 2011 Tiffin. What a difference, before it would see a little hill and down shift 1 or 2 gears. Now for the smaller hills it just goes over the top. On most other hills it will downshift 1 gear, on larger hill it will downshift 2 gears but quickly upshift again. Like others said this should be standard on the V10. I am very pleased and would recommend the 5 Star Tune to anyone. The price seems a little high but once you see what it does it is worth it. It only takes a few minutes to install and then you unhook it and you are done. We bought the unit for our 2014 Winnebago Adventurer Motorhome, with Ford V-10 in March, 2016. We only recently had the opportunity of experiencing what it really could do. Amazing! We just arrived in Bar Harbor, Maine from Sebastian, Florida. It didn’t drive at all like the motorhome we purchased. My wife even commented on how much smoother it shifted and with much less engine noise. I am really pleased with the improved operation. I drive at the speed limit on cruise control and it seems to have so much more power. The transmission used to shift down with high engine RPM’s on almost every overpass even in flat Florida. 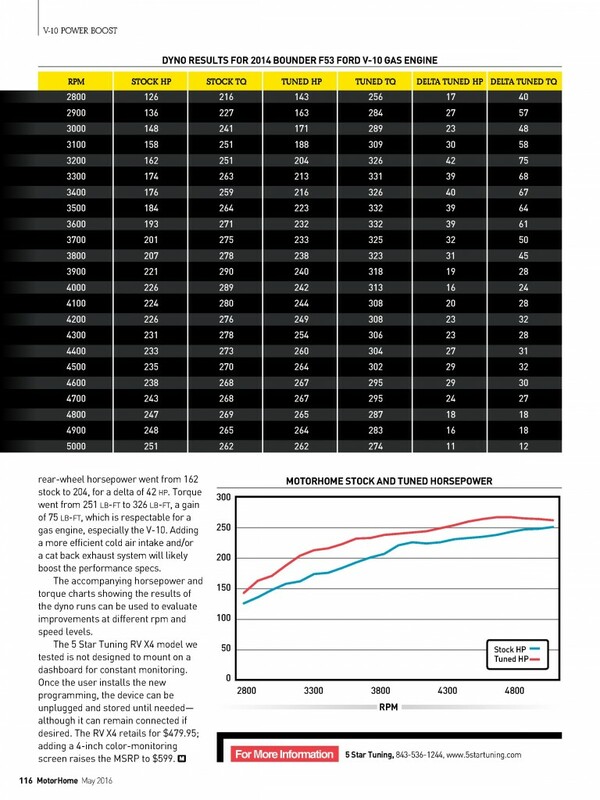 That has improved by about 80% and is not shifting to as low a gear in most cases. I am very glad we made the purchase. If I was to make any suggestion it would be to allow the vehicle to drop down in speed even more on steep hills before it shifted, if that is possible to do. Just returned from a 60 mile run in my 1999 Fleetwood, mostly freeway, with long hills. 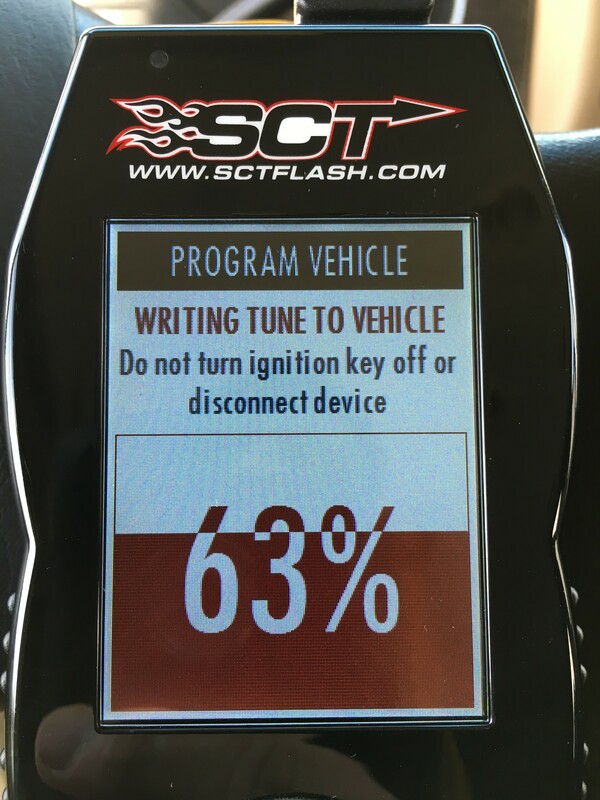 The first thing I noticed was more power and “zip” from a red light using same throttle application as usual. That was a pleasant surprise. Acceleration to enter the freeway was greatly improved, again, spry and responsive. I set the cruise control at 65 mph and waited for the first hill. Nothing happened! It just cruised to the top and over with no downshift. Couldn’t believe it. Next hill was longer and higher. Normally, it would have downshifted as soon as the climb began. About 2/3 to the top, it finally left overdrive to high gear. It shifted back to OD before reaching the top. Again, couldn’t believe it. It took most hills in stride and only downshifted for short distances on the higher ones. 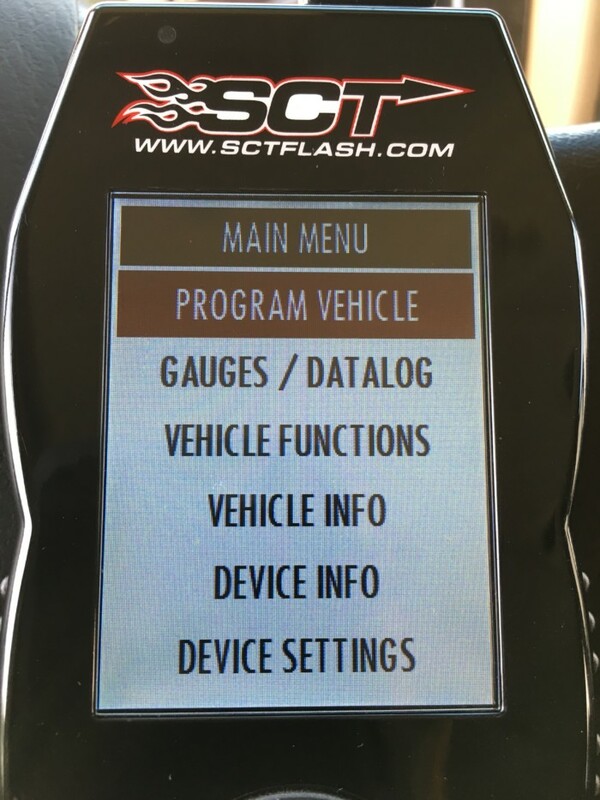 I am very impressed with the new program and will test mpg on an up coming trip. Thank you for a good product and good service. I was very skeptical about paying nearly 500 bucks for something that might not do what was promised. 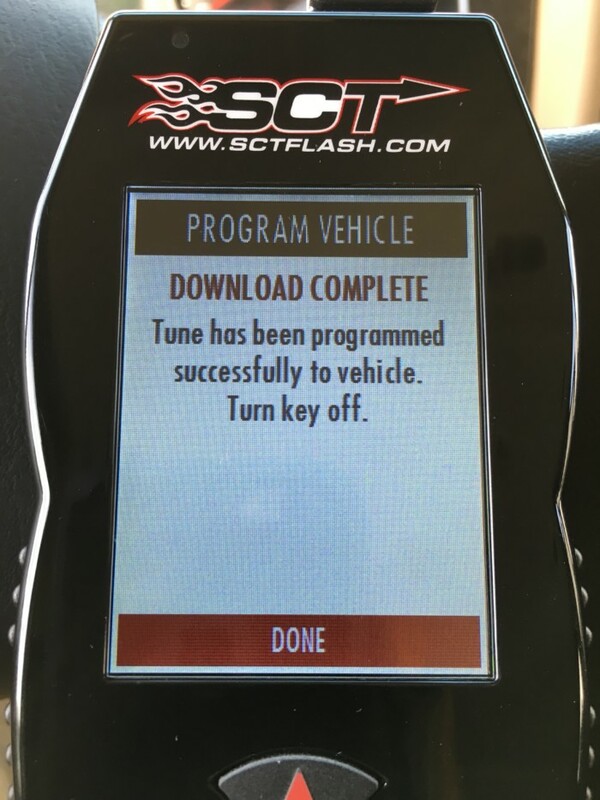 That has changed, I have driven just over 1000 miles since down loading the act tuner and couldn’t be happier. No more being scared of hills,it just performs so much better. Don’t no about mileage yet too much head wind. Took it for a drive and it made a noticeable difference in the acceleration and the shifting is now nice and firm compared to before…we are taking a 6k mile road trip starting in May and will be towing our car ….I think this is going to make a nice improvement. Thanks for your help. Thanks for the information, again. Well, we just got back from our test run for the weekend. I have to tell you that the device did exactly what you said it would do. I have a 32 foot class A motor home, and pulled an in closed trailer with the bike pictured above. Living in Northern Idaho, we do have some pretty good grades to pull no matter which way you go. In the past, I could get up them at about 45-50 mph. This time we made them at 60-65 mph. I can really feel the difference in the acceleration also. I have to fill it up to check the fuel mileage now. It has even gotten the approval of my wife and that is saying something, so therefore, I am a happy camper. So thanks again. Thanks, installed in my 2011 tiffin allegro and it does ever thing you claimed . Just drove from SW Fla. to Seattle on the northern route and handled the mountains very well. The acceleration on the on ramps has improved greatly. Thanks again. 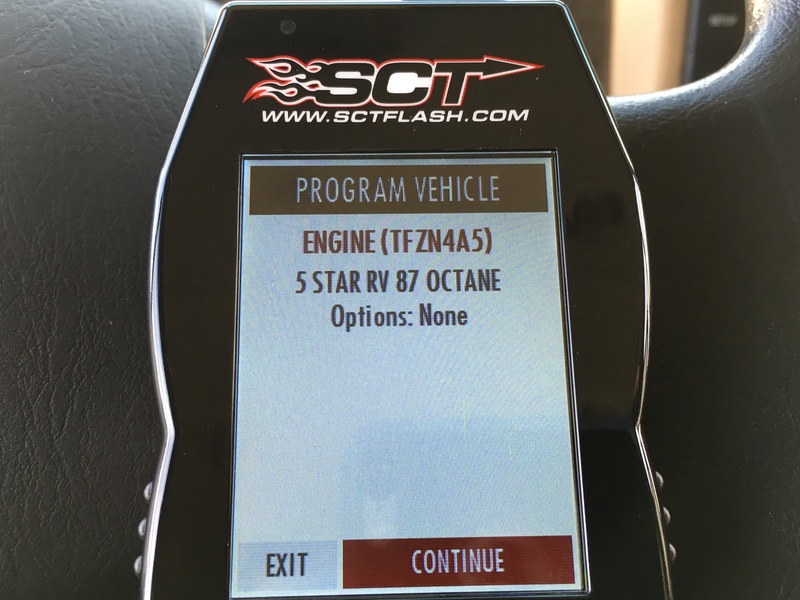 We just got back from our first trip after loading the 5 Star tune for my 2016 Ford Class C. All I can say is Wow!, this is a game changer. No more transmission hunting for the right gear. Hills are no longer torture as the truck pulls up grades nicely, changes gears when required and finally! changes back up when the grade is done. The extra torque and horsepower make driving this truck much more like a passenger car. Truly a game changer for us! We cannot recommend this product more highly. I just purchased and installed the X4 and took a trip to South Lake Tahoe Ca. I couldnt believe the difference in acceleration on take offs and how much performance I had in the mountains. It really opened up the V10 and changed the shift pattern for the better. 5 star tuning review. 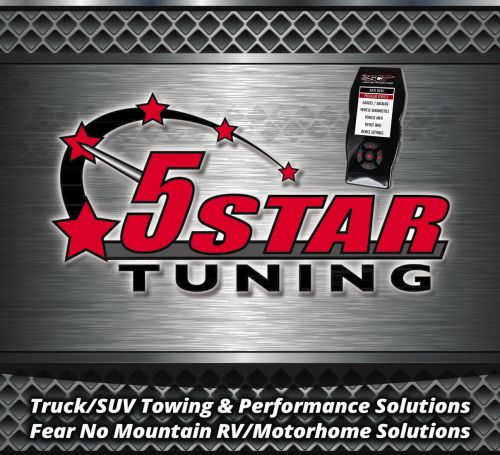 First off, I am an ASE -certified tech, Goodwrech- certified tech, 30 year business owner servicing trucks and RV’s. So, I will tell it like it is. I recently purchased a 2005 30′ Winnebago class A on a Ford v10 F53 chassis, because of the low miles and new condition. The coach only had 7400 miles since new. Since it was pristine and low mileage I made a couple road trips across my home state of South Dakota. Not satisfied with the performance, I did my research. After reading about the 5 star tuning, I decided to take the leap. Even though the price was a hard sell. 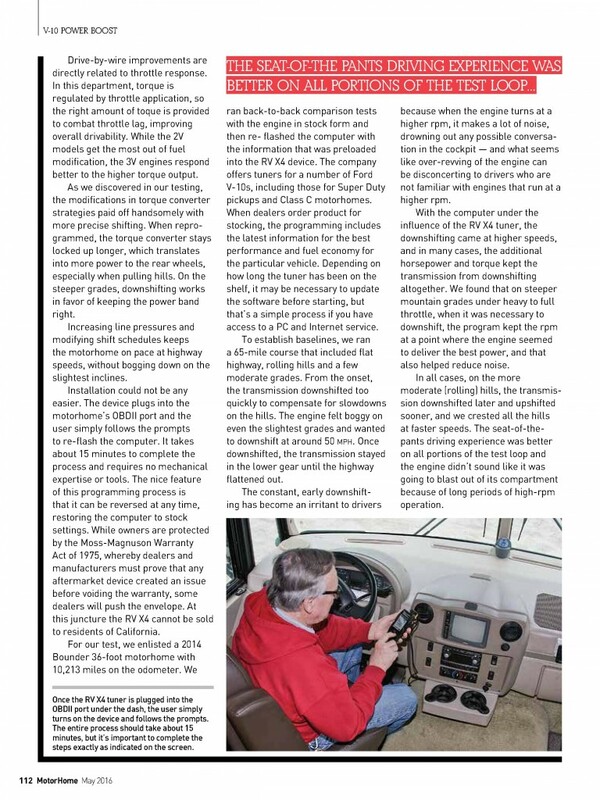 I was tired of the constant shifting from 4th gear down to 2nd gear and rpm from 2200 to 4400. I wondered why did Ford completely miss 3rd gear? Not to mention overdrive and the lock up torque converter. Thus, I likened it to driving a loaded dump truck uphill with the brakes on. Slow and sluggish. 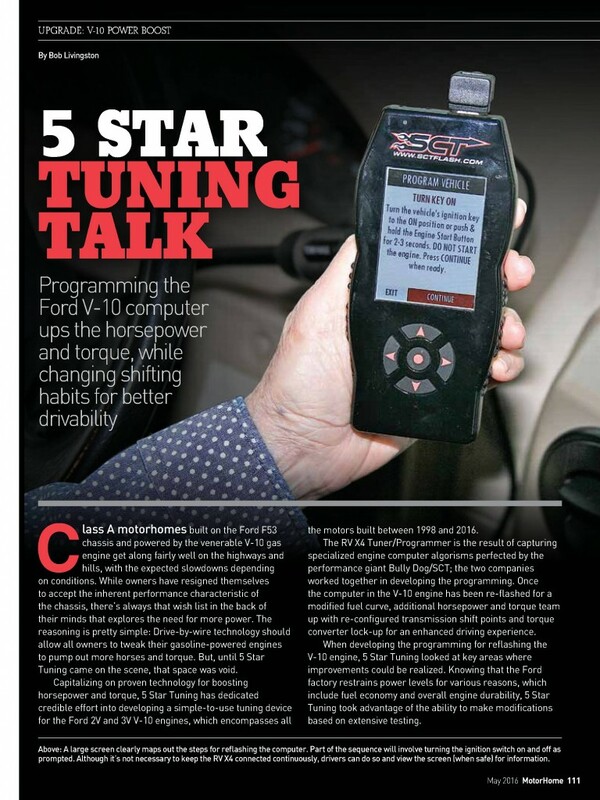 Being sceptical, I loaded the 5 star tuning on the coach, this process took about 5 minutes. Although it may take longer to those not familiar with the process. But don’t be afraid…it is simple and easy. So after a trip over memorial weekend across our rolly-polly state. Not to mention windy…and it seems I always travel only when the wind is blowing 30 mph in my face. The results.. 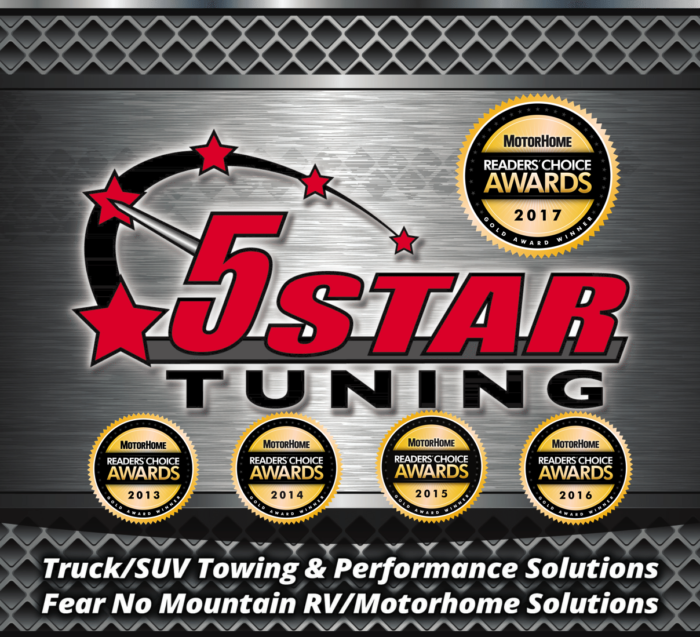 I am totally impressed with the 5 star tuning on my stock coach. It now drives like a car instead of a dump truck. The shifting has totally changed and awesome. Since I pulled a toad against the wind, I can not comment on fuel consumption. But the overall power and performance were much more than I had expected. And this was the 1st time I actually could use the cruise control across the state without it continually shifting. It now will lug down to 2200 rpm and just power over the hills. This was by far the best investment I have done on the coach. To sum it all up. I will never drive a Ford F53 v10 without a 5 star tuning installed. And that’s how impressed I am. 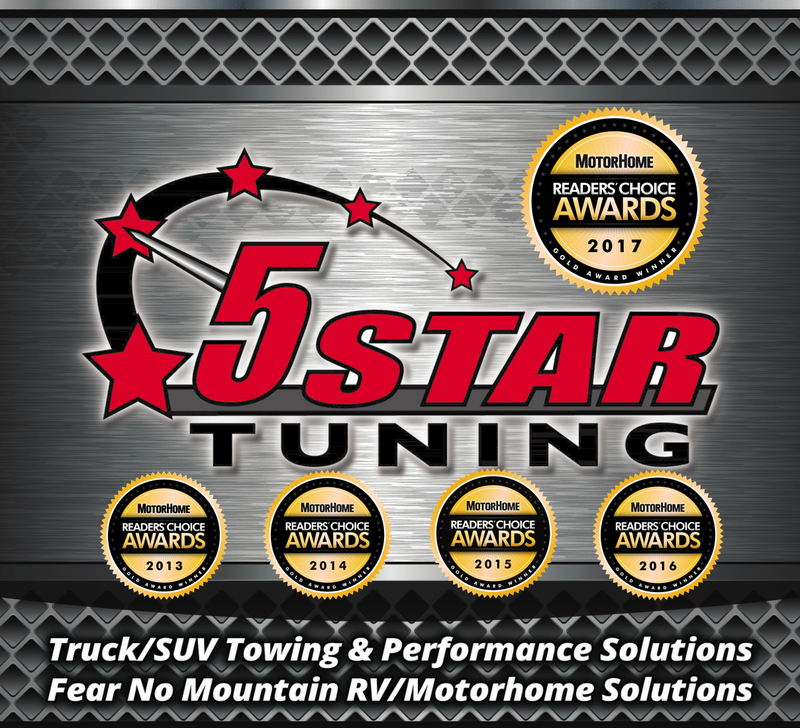 Took my first trip after installing the 5 star tune on my Thor Class A motorhome with the infamous 6.8 V-10. Let me tell you, this is awesome. my motorhome now shifts like a dream (It was horrible before.) Also I can now use my cruise control. I tried using cruise control when i first bought the coach and immediately knew it wasn’t going to work. the least little hill, it down shifted too low and the engine was screaming. now it’s perfect. Well worth what i paid. Thanks so much.